Don't you ever get completely confused when it comes to Chinese restaurant names? I mean, how many have the word "Fortune" in it? Or how about "Golden"? Trust me, one has to be very careful when they say something like, "meet me at Fortune". That could mean one of over 20 restaurants in the GVRD. You could either be dining at Oakridge Centre, Metrotown or somewhere on Hastings! Fortune Restaurant, Fortune House and Fortune Court respectively. Make sure you use the entire name! 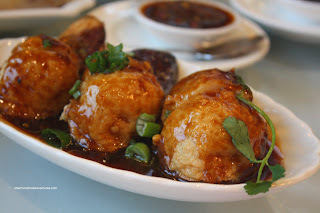 Wouldn't it be funny if somebody intended on treating their friends to an expensive meal at Victoria Seafood Restaurant; yet everyone showed up at Victoria Chinese Restaurant instead? You see, the latter is a hole-in-the-wall. 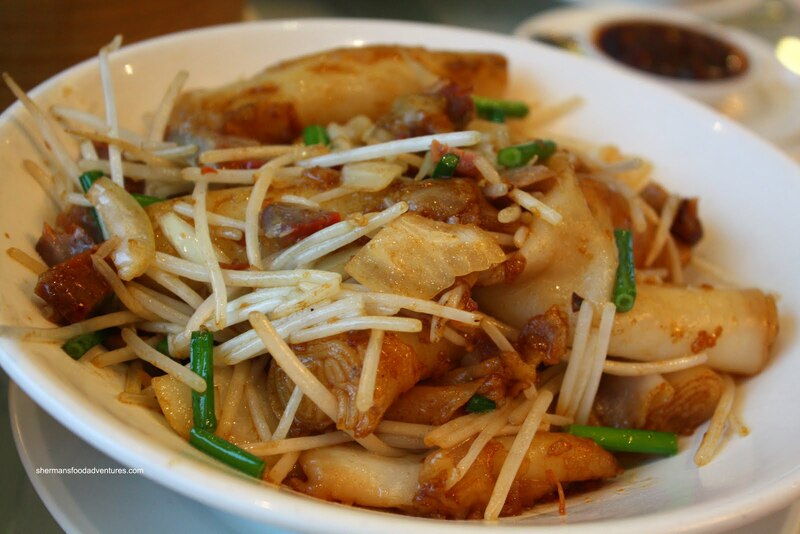 Or better yet, how about Happy Valley Seafood Restaurant and Happy Valley Chinese Kitchen? Imagine if there were 6 different restaurants named Cactus Club, Grand Cactus, Cactus Seafood Restaurant, Lucky Cactus, Cactus Fortune or Rich Cactus? Oh, how about we just add some 8's into it and call it Cactus 888? 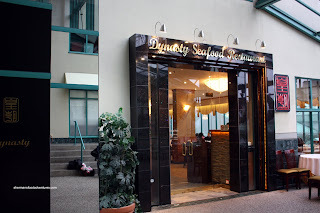 After just trying out the Dim Sum at the new Grand Dynasty in the Delta Hotel, we ended up having Dim Sum at Dynasty out on Broadway in Vancouver. Honestly, can't they think of more unique names? Well, there have been interesting names in the past. Some of which have actually ended up on Leno, such as Fook Yue out on Renfrew. Thankfully it no longer exists. I bet the greeting over the phone is priceless for the people who were not in the know... "Good evening, Fook Yue!". I seriously digress. In addition to my parents, joining us for Dim Sum were Goose and Mother Goose along with all the kiddies. As per usual for the kiddies, we got an order of the Soya Pan Fried Rice Noodle Rolls. It's either this or the stea med kind for them; but they don't make the steamed kind at Dynasty. For real? This is one of the very few times where we could not order steamed rice noodle rolls. As for these pan fried ones, they were soft and held up well to the cooking; however, they were very bland. Lack of flavour and colour. I know there is hoisin and sesame paste provided; however, it just ends up being sweet with no saltiness to balance it out. My personal preference is to not have bean sprouts in this dish. Despite being a textural contrast, I find it gets in the way of the noodles. 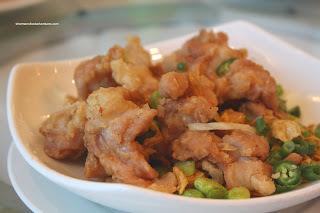 Something we haven't had in awhile was the Deep Fried Chicken Knees. For those who are a bit turned off by what this represents, it is merely the cartilage from the leg joint with some meat attached. Think of it as crunchier chicken nuggets. We liked these ones since there was a good amount of meat on them. Hence, they were not dry and we felt like there was some substance. They were not particularly flavourful though. I thought the addition of edamame interesting. 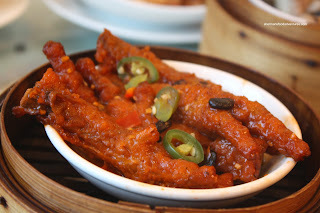 I found the Black Bean Spareribs to be quite strange. Okay, the texture was pretty good walking the line between tender and slightly chewy. However, there was a pronounced pork flavour. Before anyone decides to do the, "hey, its pork moron" line, you have to understand that it was almost gamy. Even the black bean, garlic and peppers could not hide it. I can only speculate why it was so gamy. So I'll just leave it at that. You make your own conclusions. Now onto the 2 standards of Dim Sum - Haw Gow & Sui Mai. 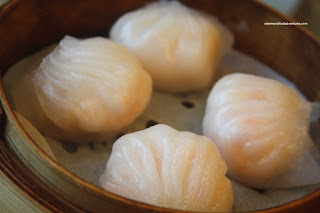 The haw gow (or shrimp dumplings) were mostly good with a properly made dumpling skin which was slightly chewy and not too thick. The filling was a bit hit and miss. 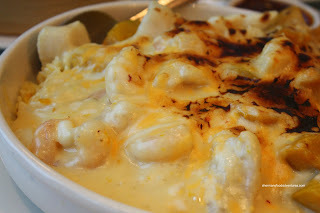 I liked the snap texture of the pieces of shrimp; yet they used too much shrimp mousse as a binding agent. It detracted from the overall texture. I thought the filling was quite tasty. It can probably be attributed to the liberal use of shrimp mousse though. 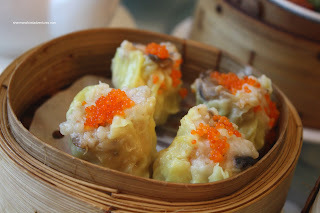 I liked the sui mai (pork and shrimp dumplings), especially the large amount of tobiko on top. Not only is it aesthetically pleasing, the pop just gives another textural component to the dumpling. The combination of pureed and diced pork had a nice rebound to it while the shrimp has a good snap. Flavour was understated with only a touch of sweetness and not too much salt. The epic fail award went to the Phoenix Talons (or chicken feet). Look at them! Scrawny, fried too long and probably over-steamed, these were pathetic. It sure didn't look like $4.50 worth of food on the plate. Beyond the dry skin, there was nothing much underneath, in particular, the gelatin. Furthermore, it was too salty. 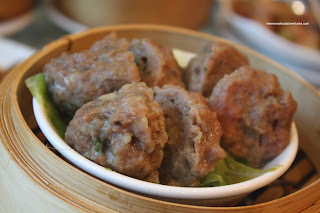 From chicken feet to beef balls, or in actuality Beef Meatballs, these were not much better. I found them to be quite mushy. Typically, the pureed beef should exhibit some resistance and bounce. Secondly, the balls were bland. I hate flavourless balls... Chef (South Park) knows best, salty balls rule! For once, I felt there was not enough cilantro/green onions. 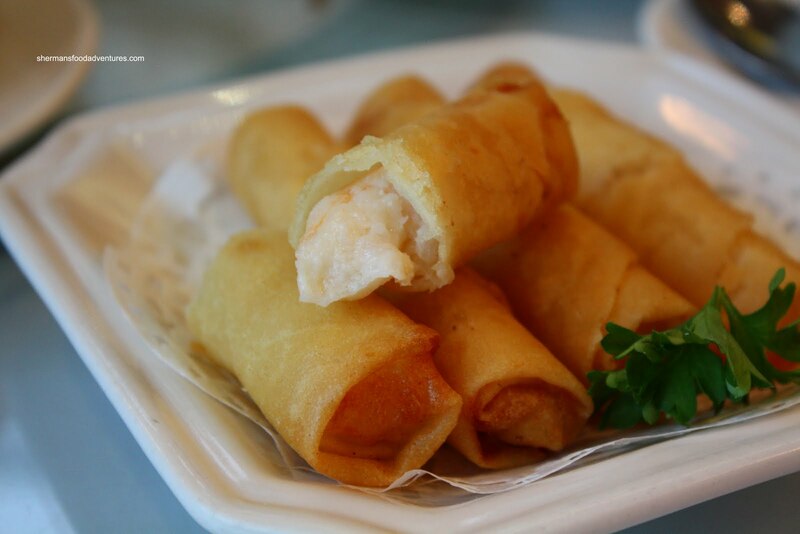 From 2 sub par dishes to a good one, we have the Shrimp & Garlic Spring Rolls. As evidenced in the picture, there were lots of whole pieces of crunchy shrimp within the crispy spring roll. Interestingly, the filling in the spring roll was better than the haw gow. Was it just by fluke? The shrimp filling was not mixed well? I would say a bit of both. Another solid dish was the Shrimp Mousse Stuffed Fried Eggplant. What they should've called it was shrimp mousse with a bit of eggplant instead. As illustrated by the picture, there was lots of sweet bouncy shrimp mouse atop perfectly cooked eggplant. The black bean sauce was a tad weak with more of a peppery kick to it than the saltiness of black bean. 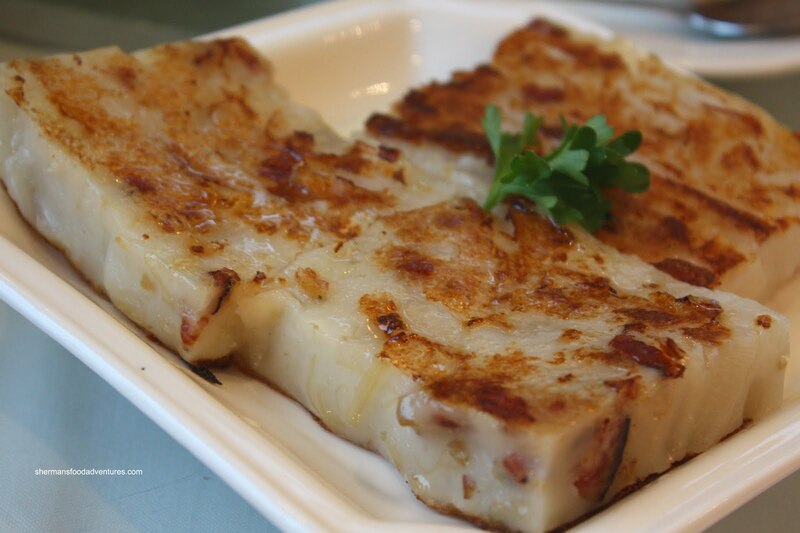 Normally, there is not too much to say about any Pan Fried Daikon Cake with Conpoy other than the texture since it is a very mild tasting item. Unlike most of the daikon cakes I've had recently, there were big chunks of tender daikon hidden within each slice. That added a nice mild daikon flavour which actually stood up to the Chinese sausage and dried scallop (which was a nice addition of flavour and texture). Furthermore, the texture was perfect. It was soft while still maintaining enough integrity to not fall apart when picked up with chopsticks. The next item was far from creative. Rather it was the good ol' Lo Mei Gai or steamed sticky rice wrapped in lotus leaves. I thought these were really good. The rice was perfectly soft while still a bit chewy. 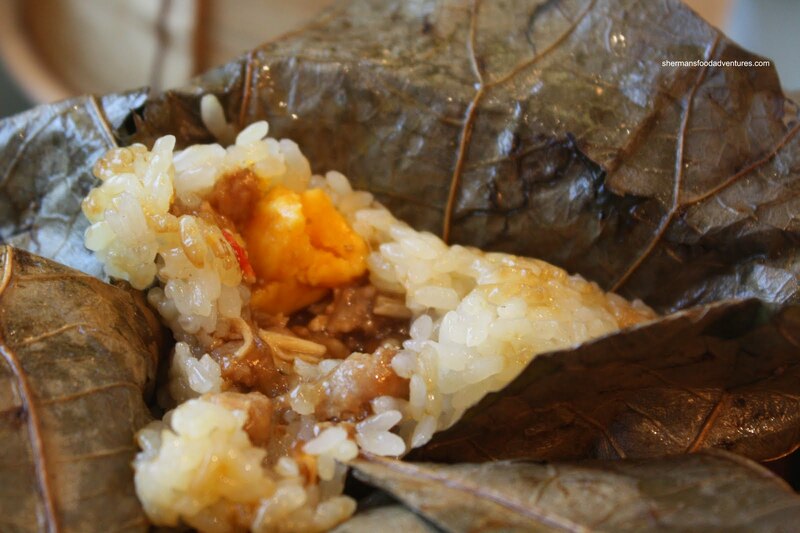 Yet, the best part was the ample amount of tasty filling which was a combination of salted duck egg yolk, ground pork, imitation crab and shiitake mushrooms. Now, there has been no offal in this meal up until now. 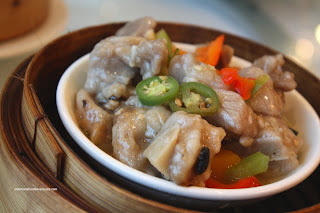 You know Dim Sum is not Dim Sum without some internal organs or things like that! We got an order of the Tendon in Teriyaki Sauce. If your reaction was less than normal, that would be mine as well when I read it on the menu. Teriyaki sauce? Fusion? Well, it really didn't taste like any teriyaki sauce I've ever had. 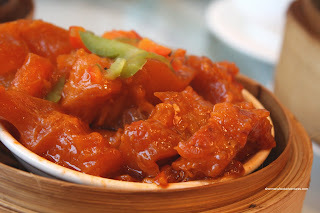 It just seemed like any other braised, then steamed tendon in an oyster-based sauce. Maybe I was missing something? The tendons were tender; yet still retained some bite. I thought that the sauce was one-note being predominantly sweet. Finally, for dessert, we got a couple of orders of the Egg Tarts. Although they were quite small, whatever in quality made up for it. 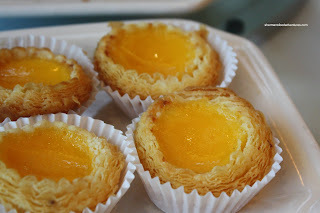 You see, this type of egg tart is the one I like most. With a flaky puff pastry shell and only a semi-sweet custard, these were served hot. A nice ending to a very uneven meal. There were highs and lows while not much in between. If we averaged it out, it would be exactly that - average Dim Sum. Not exactly sure if I would categorize it as expensive. With that being said, it wasn't cheap either. However, the pricing is fair for the level of service and comfortable digs. Lastly, they validate parking, just remember your stall number. Foods look good. 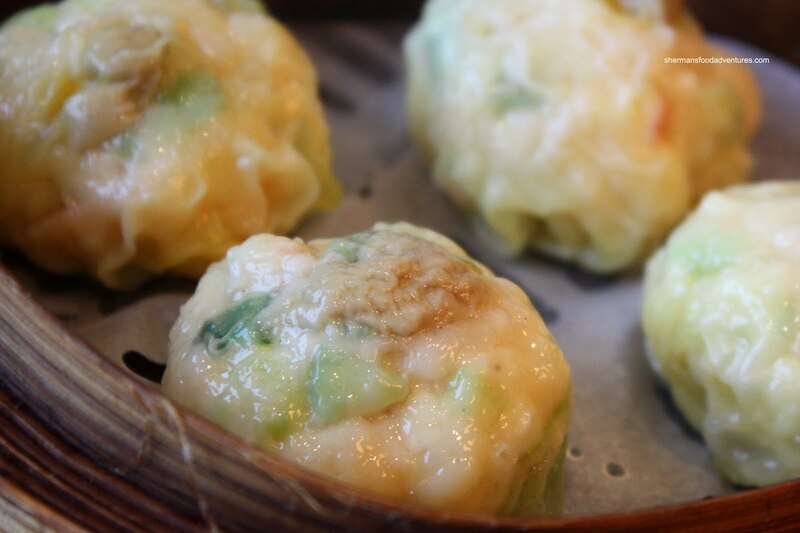 I haven't dim sum'd there since they were still East Ocean, two iterations ago. What are the prices like ? LR, the food was hit and miss for me. The prices are quite high, very similar to East Ocean, who were owned by Victoria Seafood at the time. Is this the same one that used to be on Burrard St? karolina, I'm not sure; but I did go to that location before right next to Shabusen. Could be. Thank you! I actually don't know about the one next to Shabusen. I was a big fan of the one across the street from Sutton Place...I guess now it's Sala Thai. I always wonder where to go for Dim Sum. Could you please give me some advice? karolina, now I think I'm confused. Right, it was the one across from the Sutton. The one next to the Shabusen is now an Indian restaurant. As for good Dim Sum, that is a loaded question. For me, the most expensive is not necessarily the best. I personally like Western Lake for inexpensive. Spicy Court, Sea Harbour and Grand Dynasty are good if you wanna spend the $$$. @Karolina, you can't lose with WL!